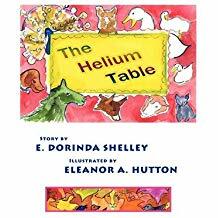 “The Helium Table” brings many well-loved farm animals together in the first “Helium” book. The story reveals a new tale that highlights the beauty of friendship, the power of teamwork, and the value of selflessness. Dr. E. Dorinda Shelley reveals a tale that highlights the beauty of friendship, the power of teamwork, and the value of selflessness. Together with her illustrator, Eleanor Hutton, they bring a great story to life that will both inspire and delight every reader. As the story unfolds on every page, she introduces lovable characters and shares a delightful adventure for young ones to enjoy. Also, her creative storyline is a wonderful and exciting way to tap into the young ones’ imaginations. The Helium Table begins as the farm animals discover an eye-opening sight: when medical books are moved to the floor, the table suddenly floats out the door like a balloon. Understanding the value of helping out, everyone works together to save the table, but it continues its journey up into the sky and towards outer space! Will the animals successfully bring the table back to Earth where it belongs? If so, how? Find out what happens as The Helium Table joins the upcoming 2018 Miami International Book Fair. Along with the second and third parts of the series, Shelley’s creations will take part in the festivities on November 11-18, 2018. Be sure to check it out! Dr. Shelley is a retired dermatologist. She grew up in Missouri, spending weekends on a farm with friendly horses. She, her husband, and three children lived for many years on a “farmette” in NW Ohio, surrounded by many of the animals in this story. This is the second in a series of books she has written and Eleanor Hutton has illustrated.